Nobu Hotel Marbella - one of Marbella's finest luxury 5 star hotels for adults. 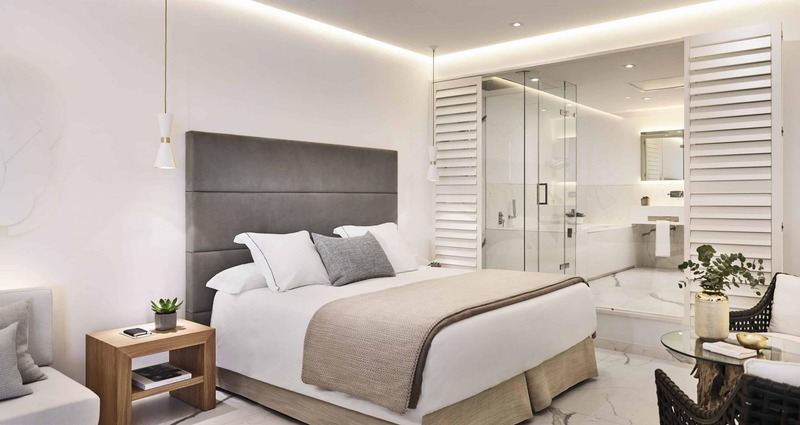 The luxury 5 star Nobu Hotel Marbella (a member of Small Luxury Hotels of the World – SLH) is located on the beach in the golden mile is one of the top luxury resorts in our Marbella Collection. Nobu Hotel Marbella`s privileged location in the heart of Marbella`s Golden Mile on the beach near Puerto Banus, makes it the perfect choice for a luxury beach holiday hotel in Marbella. What we say: ‘The Golden Mile has long been regarded as being one of the best and most conveniently located resort areas in Marbella, and with the addition of Nobu Hotel Marbella – makes it streets ahead as the most exclusive resort in Marbella. Ideal for adults or those looking for a spa or sports break, this stunning 5 star luxury Marbella hotel is a must for any luxury Marbella holiday. Think funky rooms, adult only pools………and service to die for’. 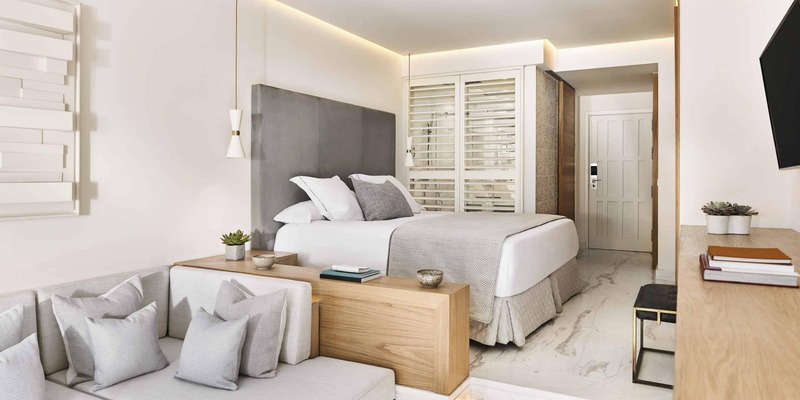 Curated for the playful, Nobu Hotel Marbella overlooks the buzzing food mecca of the Plaza. Boasting an array of world-class amenities, guests of this 81-room resort will have VIP access to Marbella’s most chic nightclub, La Suite, the Nobu restaurant and lounge, the private members Owner’s Club, in-room signature treatments from the Six Senses spa, in-room Nobu dining, sun loungers on the beach as well as a private pool bar with evening DJ sets. All guests of Nobu Hotel Marbella will have exclusive access to Marbella’s best kept secret, The Owners Club with its own private lounge, relaxing bar, all day dining, business centre and full concierge service. The hotel features rooms and suites overlooking the vibrant Plaza (hence more ideal for adults rather than young families), the centre stage for its bustling food scene and array of restaurants, the signature restaurant is Nobu Restaurant and bar where Nobu hotel guests have priority table seating. The hotel guests can also enjoy Private VIP access to La Suite, the nightlife experience in Marbella with its own private outdoor terrace for moon lit nights to the indoor DJ international music club scene. Day time is spent at the private Nobu pool, a tranquil retreat from the night before. Here relaxation and detox goes hand in hand with treats served throughout the day that refuels your body. For a busier lifestyle, private Nobu sun loungers with its own beach access brings the volume up and you can continue enjoying the day until the night starts again. A private social space is available on request for meetings, gatherings or private parties for up to 60 guests. beyond. The open plan is a social space, the bathroom flows into the living space as the translucent glass walls does offer a sense of space. Comfortable in and outdoor seating create spaces to read, relax, and enjoy a drink or even an in room Nobu dining experience. The décor is elegant, soft colours and features seating arrangements for both in and outdoor, spacious wardrobes, space to dine and exquisite art work. Oversized LED TV with the ability to connect any iOS device as well as to watch a major list of international TV channels. Illy espresso machine and tea making facilities. Elaborate signature mini bar stocked with major international brands, daily ice service at turn down. Nobu room service menu on offer as well as an interactive tablet mobile ordering and information service, 24 hours a day. All rooms’ features en suite shower and separate lavatory with Natura Bisse amenities, GHD hair dryer and straightener as standard. ABOUT The hotel’s signature restaurant is the heart of the Nobu experience. As relaxed and unpretentious as it is arousing and spontaneous, the atmosphere is high-energy with a distinct air of celebrity. The dining concept is centered on its signature dishes and cocktails. The innovative menu features exquisite Japanese-fusion cuisine with signature dishes such as the Yellowtail with Jalapeño and Black Cod Miso. Guest can dine at the sushi bar, in the dining room or at the Nobu terrace overlooking the Plaza in the heart of the hotel. The atmosphere is upscale, playful, high-energy and indulgent. It represents Marbella for the stylish grown-up set. A magnet for food lovers, tastemakers and celebrities. Nobu is a rate spot where you can enjoy the freedom of life. Expect group of friends catching up over great food and cocktails. Hotel guests, locals and Marbella regulars blend effortlessly to create and animated vibe. CONCEPT New York City loft-inspired club mixed with the impressive Roman heritage of the property; DJ’s and theme parties dominate the atmosphere with its international partygoers enjoy an all-night fun loving environment. ATMOSPHERE Playful, fun, experimental, thrilling and vibrant. refreshing snacks and signature Nobu items. All day drinks bar and complimentary refreshments. ATMOSPHERE Strongly linked to the Nobu restaurant with its cool, playful and seductive poolside vibe. DJ jam sessions and management drinks at sunset a couple of times a week. Beach umbrellas and Nobu cabanas along the beach front of the Mediterranean featuring beach club service and Nobu signature massage treatments. ATMOSPHERE Laid back beach vibe, laze all day and listen to the waves of the Mediterranean. OFFER All day dining with comfort dishes and Nobu signature items. Breakfast menu: Nobu signature breakfast. The day menu is built around Nobu signature dishes as well as easy comfort food such as Caesar Salad, homemade Burger, Club Sandwich and light snacks. 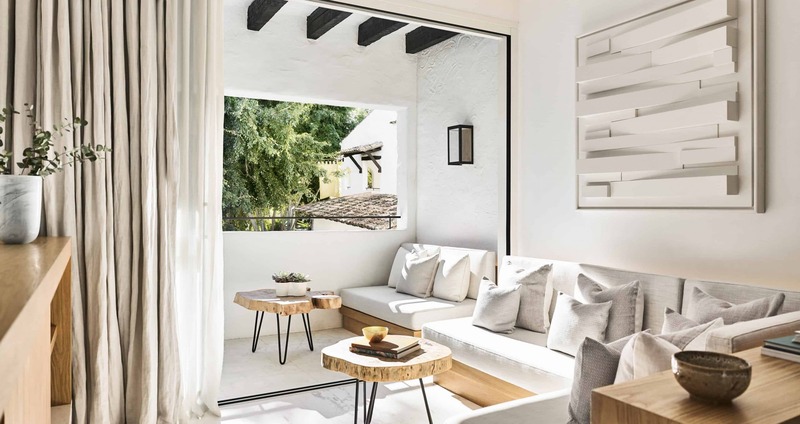 Six Senses Spa Marbella delivers integrated wellness experiences and provides guidance and inspiration to allow guest to gain a new perspective and make positive lifestyle changes. These experiences are being delivered in one of the most magical locations with a view overlooking the sea and surrounded by lush sub-tropical gardens allowing guests to keep a closer connection with nature. There are six interior treatment rooms plus three canopied cabana rooms. A wet area features hydrotherapy and cold plunge pools, experience showers, herbal steam room, sauna and hamman. The menu features Six Senses signature treatments and wellness therapies plus locally inspired options that combine herbs and sea salt, olive oil and rich minerals to offer truly Mediterranean experiences. Manicure and pedicure is also offered. Nobu Hotel Marbella is located in the heart of Puente Romano Resort in Marbella’s Golden Mile. 35 mins by car from Malaga airport.